This folding screen comprises 12 wooden panels joined together by hinges. The decoration of a continuous landscape indicates that it was intended to be viewed at a distance. In a Chinese home it would have served a decorative function as well as acting as a flexible room partition. In a British home it would have represented the owner's interest in things from the East. Twelve-leaf screens were expensive items even in China, where they were often produced as birthday gifts for high-ranking officials. The animals, plants, pavilion, waves and numerous vessels around the borders are all symbols of happiness and long life. Initially the British called these screens 'Bantam work', after the port in Indonesia through which they were shipped. In the 19th century they came to be known as 'Coromandel screens', as they arrived in Europe via the 'Coromandel' coast of India. The technique of 'kuan cai' or 'incised polychrome' was unique to China. It involved cutting the design into a base made of brick dust, pig's blood and lacquer, and then filling the incised areas with coloured lacquer. 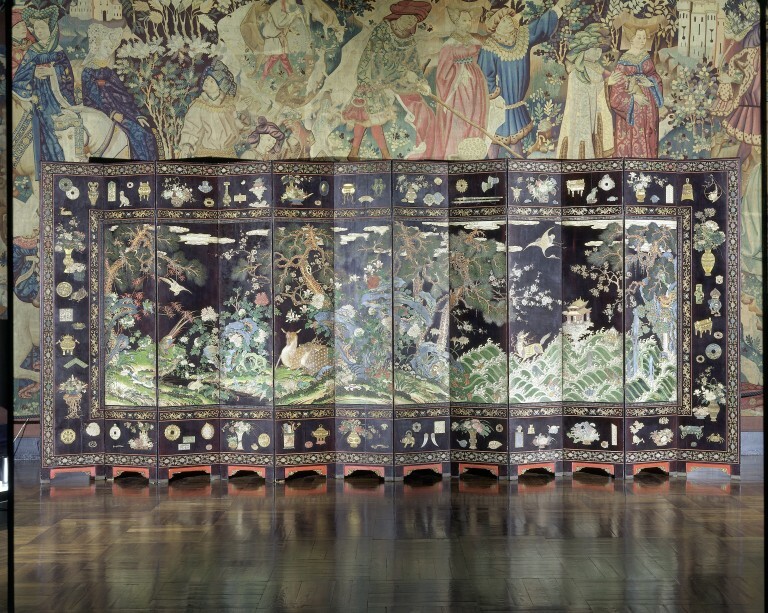 This type of large lacquer screen is generally referred to as 'Coromandel screen'. The earliest use of this term seems to be in 1782, in a Parisian auction catalogue (Camille Gronkowski, Le gout chinois en France: les paravents en laque de Coromandel, Renaissance de l'art francais no.5, 1919, p.491, quoted in Chou p.128, NAL press mark C98.0021). In 1688, this type of lacquer was described as 'Bantam work' (John Stalker and George Parker, A Treatise of Japanning and Varnishing, London 1688). The motifs on similar screens fall into two major catagories: 1) figures in pavilions, with the 'spring in the Han palace' theme being the most popular, 2) landscape (Chou p.202) or animals/birds amongst trees (Chou p.246). Some rare examples show Europeans rather than Chinese figures (Dallas Pratt collection, Christies London Furniture Dept sale 16/3/95 lot 180). A most interesting example depicts Europeans bearing gifts to China (ex Pelham Galleries, in FED picture library). 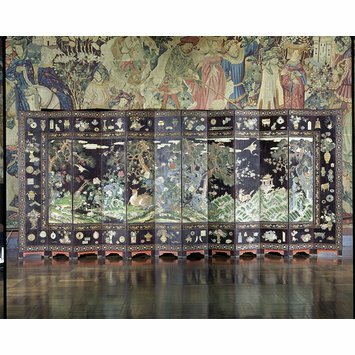 The said screen was made in 1674 as a birthday present to a military officer in Guangdong, who would have seen many European merchants. So far all known dated kuan cai screens are from the Kangxi period. Garner illustrates one screen dated 1659, citing the Freer Gallery as the owner (p.261). But Freer Gallery has confirmed that they possess no such screen (Chou pp 65-66). It fact it was ex Spinks 1972. From the photograph (in FED picture library) the colours are very pale and the entire screen looks more like a mother-of-pearl object than kuan cai.